Having tough times figuring out how to decorate kids bedrooms? Kids are fickle and get bored of something pretty fast, so you need to choose the right color schemes, accessories and furniture. In this article on interior designing of children’s rooms, find out what they love! How to design kids bedrooms is a much asked question since children are fickle and they easily get bored of one thing. So you need to know exactly which décor, furniture, color scheme and accessories they are going to love as a part of their room. 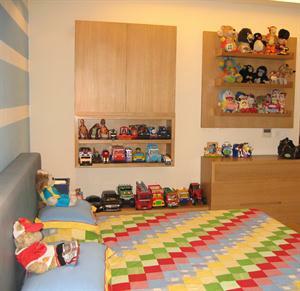 Kids have their own world and fantasy; so a kid's room should be fun and energetic, just like them. When you are going to design your kids' bedroom it is very important for you to take note of their choices and preferences for they are the ones who will be in here most of the time. There are many different aspects that must be kept in mind while designing your kid's room. First, make a basic plan and then sketch it out in full detail by noting down the room's dimensions, window size, location of electrical outlets etc. A child's safety is, of course, the first thought when choosing kids bedroom furniture and accessories. It is must that when your child enter in his room he or she should get positive vibes there. How to decorate or design children's bedrooms? Here are few steps that will help you do up your Kids bedroom interiors without the help of interior designers. Kids bedroom furniture should be according to their age and need, as we all know that kids are born explorer and the furniture of their room give them lots of opportunity to explore so choose that don't put a child at risk for injury. Purchase furniture that is simple in design and have round corners. Modern bedroom furniture tends to offer both durability and safety features. You can also use old furniture of their room by giving them a new look.You can also use wall hanging bookshelves and organizers. Use beanbag chairs, low desk or table so that they can sit and do their homework and feel like they are relaxing at the same time. Kids bedroom accessories play a very important role when you design your kids' bedroom. You can use so many items to decorate your kids' room like duvets (a light quilt, with a washable cover), colorful bed sheets, bookcases, and hanging storage, which can help you complement the design of your child's bedroom. It is not necessary that you buy the accessories from market you can design them at your home also with just a little imagination and creativity. How to choose color scheme for Kids bedroom Color is another important factor that should be considered when you are going to decorate your kids' bedroom. Choose bright and shiny colors that will stimulate a child's energy. It is good to use water-based colors that would make cleaning easier. You can create pictures of our solar system, dinosaurs, favorite characters, and more by using glow in the dark paint! You can also take your kids' ideas also while painting their rooms. Kids bedroom furnishing should be according to their age and it should be light and easy to handle. Use printed curtains; trendy curtains of cartoon characters, alphabet curtains or curtains of any special theme. Use nice and soft furnishing so that your kids can feel the comfort. Kids bedroom lighting can be very challenging to design. Do not use the lighting fixture producing too many shadows. Use simple direct light that will radically illuminate the entire room brightly. Do not use the lights which are difficult to operate or have lots of wire. Use the lights which can be easily cleaned and replace. There is no need to buy very expensive lights for kids room. Try to use soft lights instead of using very bright. It is possible to provide your child with facilities, style, comfort and safety. and above mentioned tips and ideas will surely help you to redesign your kids' room.